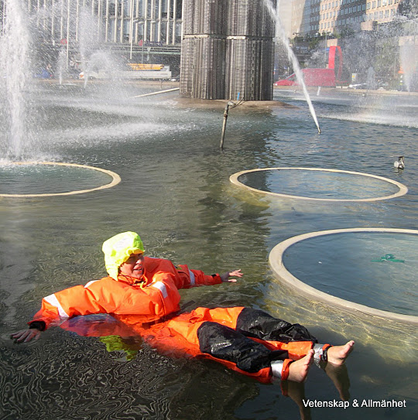 Polar researchers in survival suits in Sergels torg’s fountain during Researchers’ Night Stockholm 2006. A significant risk factor for all activities and events planned in Sweden is inclement weather. It is essential to have a contingency plan, particularly for outdoor activities so that they can be moved indoors or into a tent or marquee. There is always a risk that participating researchers will be unable to attend due to ill health or other reasons. Alternative researchers or other participants should be asked and prepared in advance to step in if this is the case. There is a risk of a poor response from target groups and poor attendance. A high level of marketing activity will s of course increase the number of visitors attracted to the event. Many people at an event can make the activity conspicuous to passers-by and may attract more spontaneous visitors from the street. Another strategy to minimise the risk is to ask people to pre-register for the event. This will allow the level of interest to be assessed in advance. The risk of low visitor numbers is greatest with a new event or activity. It takes time to work out which approach or format works. In summary: organisers should prepare a contingency plan early on in the planning process to manage various types of risk.